Newport County boss Justin Edinburgh says Aaron O'Connor deserved his hat-trick against Bury after a frustrating spell with injuries. O'Connor played only four games last season because of a troublesome groin injury. 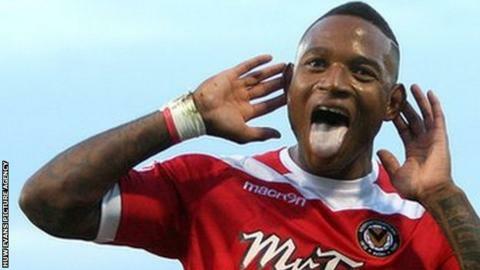 The ex-Luton striker has made 20 appearances this season and his hat-trick took his tally to seven goals. "It's been a long road to recovery but I've worked with the boy and know what he's about," Edinburgh said. "Early in the season people were questioning him but I've undoubted belief in him. "He's had to come along a road of recovery and has had a lot of injuries and setbacks. "But we're certainly reaping the rewards of his great play at the moment. He deserves it." O'Connor has now scored five goals in four games and he fired fired County ahead after just two minutes against Bury in League Two. Danny Rose's 25-yard finish brought the Shakers back into it, but O'Connor rounded Loach late on to seal a 3-1 win at Gigg Lane.